Our vineyard practices are European inspired. In the non-Mediterranean viticultural areas of Europe, growers experience situations similar to ours here in the mountains of Virginia: diverse soils, erratic weather, and a small scale. They have learned to micro-manage each site according to its needs. 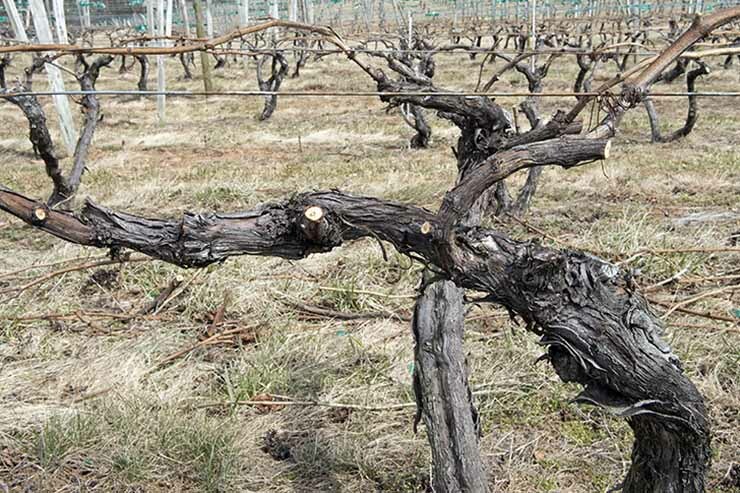 Vineyard practices change as the growing season unfolds: hot, wet, dry, cold. Every spring we look with great anticipation to the new vintage. After 30 years of experience, vineyard practices have become intuitive rather than scientific. We prepare for, and then react to, the weather. Living this close to the elements and by the rhythm of the seasons is the greatest reward for what we do. Pruning is our favorite job in the vineyard. The pace is relaxed. One gets reacquainted with the vines. It is a good time to review the past season and gauge the well-being of the vines. Most of our vines are now cane pruned. We converted from cordon pruning in 2004 and are pleased with the results. We typically leave two buds per foot of canopy. We rough prune first in November, and then start the fine pruning in February with Petit Manseng, Petit Verdot, and Vidal, our most cold resistant varieties. The task is leisurely until March when the pace quickens as the April deadline approaches. We come back through the vineyard after pruning to repair trellising and tie canes. Bud break usually begins with Chardonnay in mid-April. By May we begin removing undesirable shoots that grow from the crown, trunk, and canes. With some varieties (Cabernet Franc and Petit Verdot) we have to make two passes. The goal is to leave about 2 to 3 shoots per foot of canopy (6 to 10 shoots per vine) depending on the variety, training system and soil. We are looking especially for uniformity of shoot size and spacing. A good deal of June and July are spent tying shoots to the wires. Some shoots do catch the wires by themselves, but most need help. We use a Japanese tying tool that dispenses green ribbons to hold the tender shoots to the trellis wires. This is very laborious, but it is necessary to attain uniform sunlight interception and quick canopy drying after a dew or rain. Also known as summer pruning, hedging is done by hand two or three times a season. Rainy years promote more vigorous vine growth, requiring more hedging. Our goal is to retain approximately 15 leaves per shoot. Lateral shoots are either removed entirely or cut back to a few leaves. Also known as leaf pulling. We start around bloom to remove some of the leaves around the clusters. This is done to promote better drying after a rain, which reduces disease pressure. Leaf pulling also allows more sun on the clusters, for riper flavors. If the growing season is hot and sunny, we may only pull leaves on the east or north side of the canopy. In July the vintage’s yield potential is estimated and a decision is made whether or not to reduce the number or size of clusters for quality reasons. Yield goals range from 2.5 tons per acre to 4 tons per acre (30 to 50 hl/hectare) depending on the variety, season, and wine. We thin in July just before veraison. The reds are thinned again a final time at veraison (green harvest) when we can see which clusters are further behind in ripening. With the reds we remove the clusters with more green or pink berries so that ripening will be more uniform. When and how to pick is one of the most important quality and stylistic winegrowing decisions. We have begun to understand our individual blocks. Some ripen faster than others do because of soil characteristics or slope aspect. Young vines ripen faster than old vines. The south or west sides of the canopy ripen before the north or east sides. Cabernet Sauvignon can weather a rain much better than Sauvignon Blanc. This knowledge of the vineyard is much more important than knowing the sugar or acid content of ripening grapes.